Gwen Stacy. 2010. Watercolor on paper, 9 × 12˝. 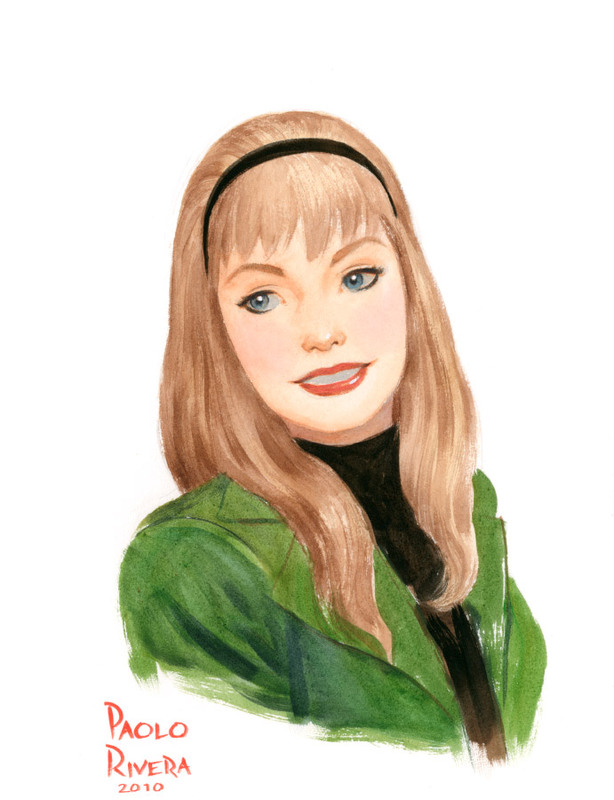 As promised, here is the second Gwen Stacy commission from the New York Comic Con. I've just wrapped up a fabulous week at Marvel, absorbing theories, advice, anecdotes, and good cheer from two legends in the industry, Klaus "In the House" Janson and Howard "The Duck" Chaykin. It was great being back in school again, even if only for 3 days. It was also great just seeing my editors on a daily basis, people with whom I have worked for over 8 years, but rarely see. Having face-time with the crew made me particularly excited about our next endeavor. I can't reveal anything just yet, but there will be a huge announcement next week. It's going to break the internet in fifths.